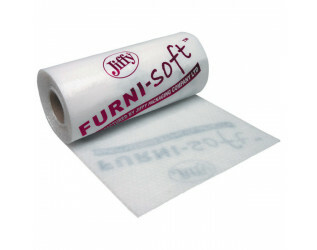 Jiffy Furni-Soft has the same qualities as Jiffy Furni-Guard but with an extra soft inner lining to protect delicate furniture surfaces from knocks, scratches, and vibration. High quality cushioning Jiffy AstroBubble is laminated with an LDPE outer and a soft non abrasive inner lining to gently protect the furniture surface. These rolls are ideal for removals by furniture manufacturers, wholesalers, and retailers. This product is an innovative alternative to traditional transit blankets that offers additional protection benefits and high quality presentation. Provided on a roll, Furni-Soft can be easily cut by hand and applied for a high quality professional finish.